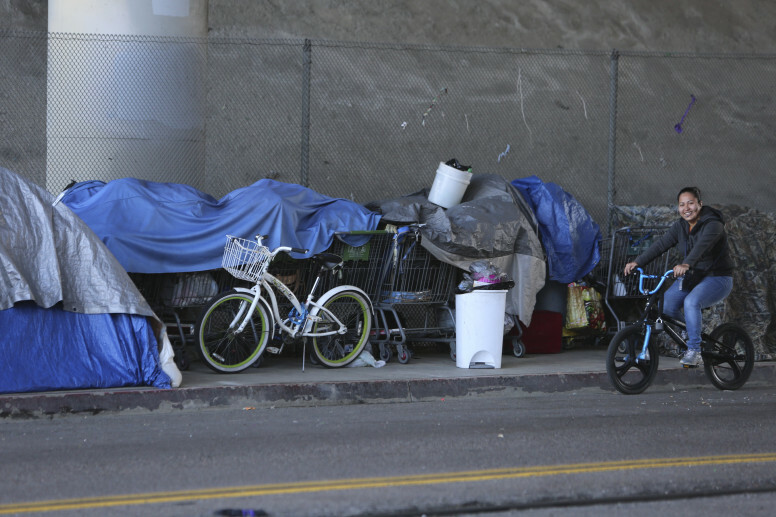 Homeless tents and encampments that stay up during the daytime are some of the most sophisticated and permanent of them all. 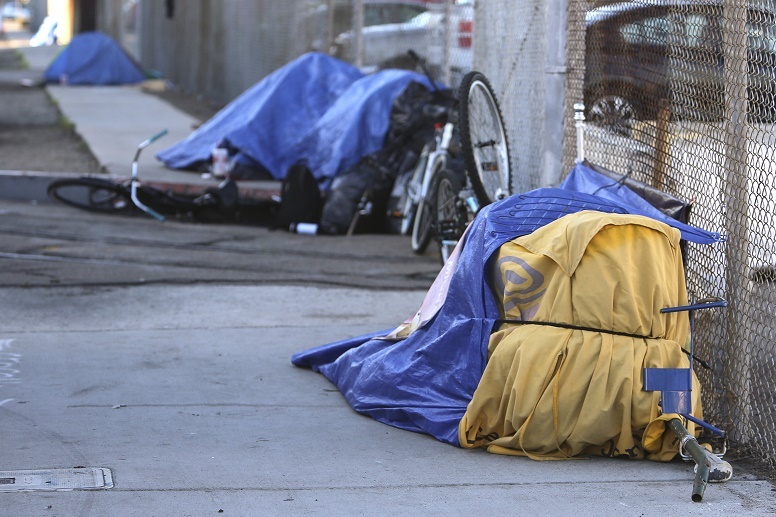 On March 7, the city of San Diego performed planned sweeps of homeless encampments downtown, sparking a conversation about this ever more conspicuous feature of downtown life. 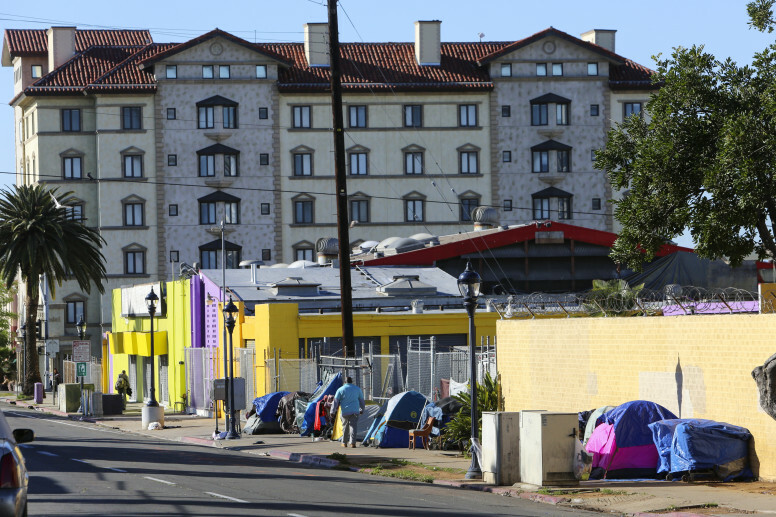 Photographer Jamie Lytle and I decided to roam downtown and other places around the county to see what images we could capture on a single day — March 9 — of the tent cities. The nonprofit Alpha Project agreed to help. It turns out, after several hours of work, we still came up far short of capturing a full image of how many there are now. One of our issues was timing. The settlements grow vastly at night — a sort of bloom that recedes sometimes very early. But the ones that remain in the daytime are some of the most sophisticated and permanent of them all. Here are some of the pictures we got. We started on Harbor Drive just after 6:30 a.m. and found a handful of tents and tarps leaning against a fence. Most of the inhabitants were still asleep as we walked down the street. Our next stop was 17th and K streets near the Neil Good Day Center, where the homeless can gather and be connected with services during the day. When we arrived, about a dozen people were packing up their tents after spending the night there or on a nearby plot that our Alpha Project tour guides said had housed as many as 100 people before recent clean-up efforts by Caltrans and the California Highway Patrol. We found another dozen tents about a block down the street, directly across from the center. We found a larger homeless encampment a few blocks away on Commercial Street. Steve Hillard welcomed us as we walked into an underpass lined with about two dozen tents and tarps. 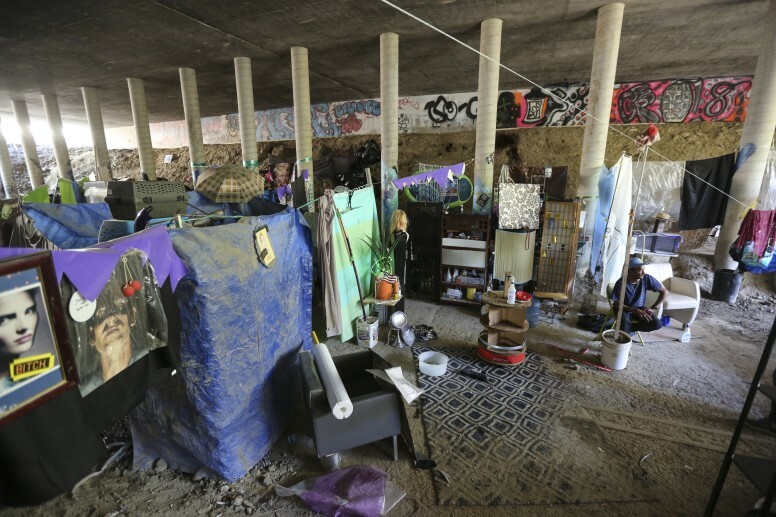 Hillard said he’s lived underneath the bridge on and off for eight years and has noticed far more people on the streets – and underneath his underpass – in recent months. Our next stop was a detour outside San Diego. 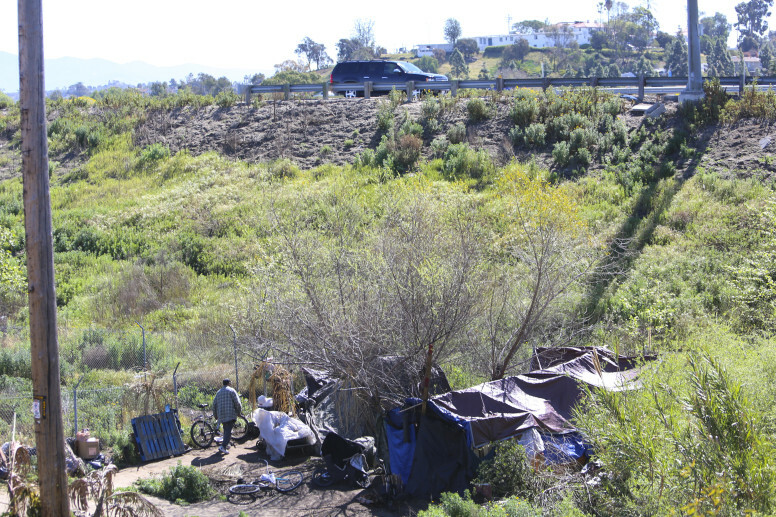 It’s been dubbed the Bonita Jungle and it’s just north of the Sweetwater River in National City. Cars drive by on State Route 54, unaware of those living below them. An Alpha Project case manager told us police had found seven people living here before we arrived. She estimated there are at least 15 people living in the immediate area. The next encampment we visited was even more hidden. 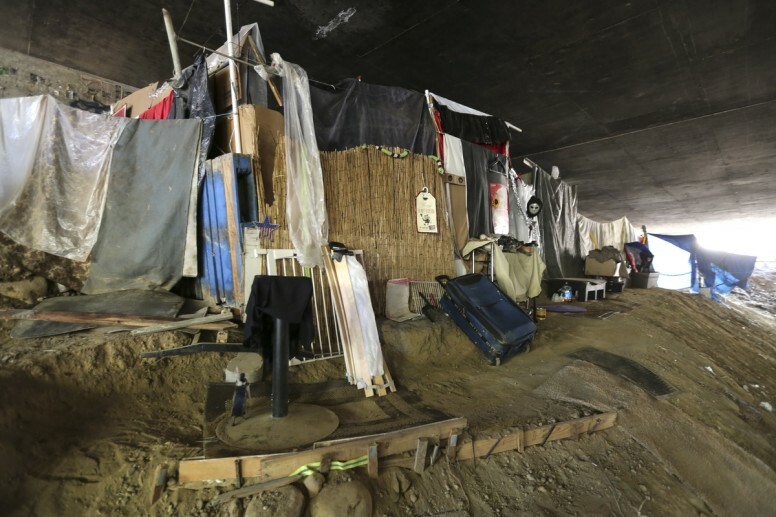 It was nestled under a bridge behind a massive apartment development in Mission Valley. This is the house that Mac built. Mac, who asked that we not use his last name, has set up multiple rooms, artwork and enclosures in this space underneath Friars Road. He’s even got a kitchen with a stove-top skillet. Mac expects he and the three others who live here will be forced out soon. He said he’s been told he’ll need to move but recent rains have slowed the process. “We know at any moment it could be time to go,” he said. We left Mac’s place just before 1:30 p.m., knowing we saw just a sample of the makeshift homeless settlements across the region. Homeless folks we talked to described how tent cities expand and crop up in the evening and disperse early in the morning. 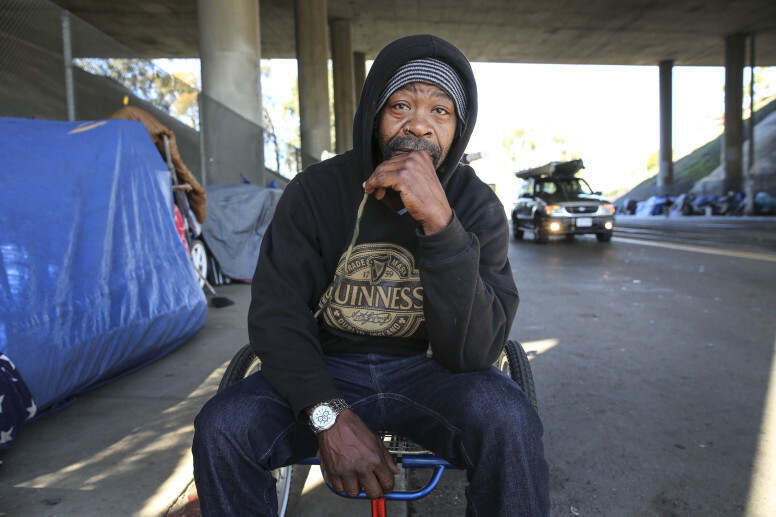 We’ll share some of the stories of those we met and consider documenting more homeless encampments in a future post. 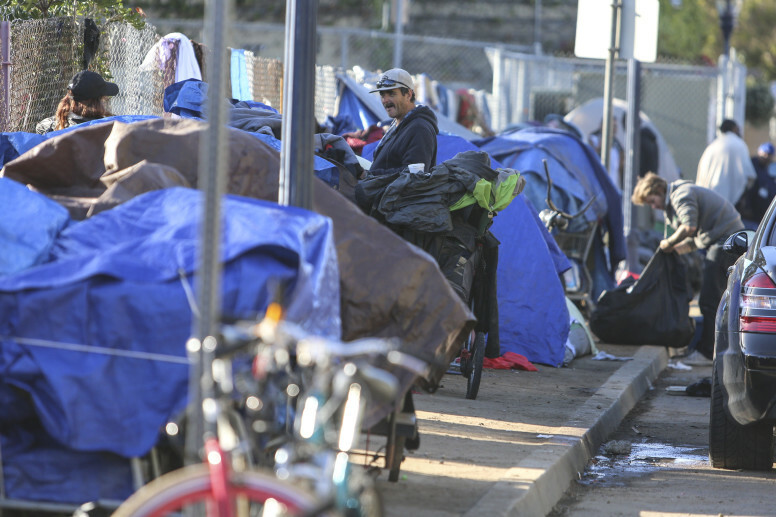 Want to tell us about any tent cities you’ve seen, or share photos? Leave a comment here or email me at lisa@vosd.org. All photos by Jamie Scott Lytle.